What I would call a modern classic (in a similar league to Scattergories), essentially being a convenient repackaging of the old parlour game Dictionary. 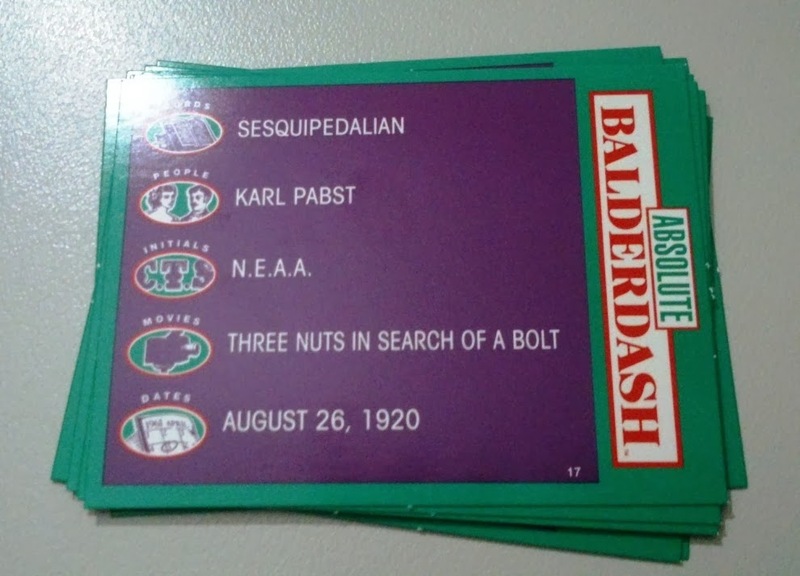 Differences in Edition: The "Absolute Balderdash" edition increased the categories of the original 1984 Balderdash game by establishing Words, People, Initials, Movies, Dates as its five categories. Apparently "Absolute Balderdash" is also known as "Beyond Balderdash". The Australian edition is different to the UK edition in that the former has Dates rather than Law as a category. 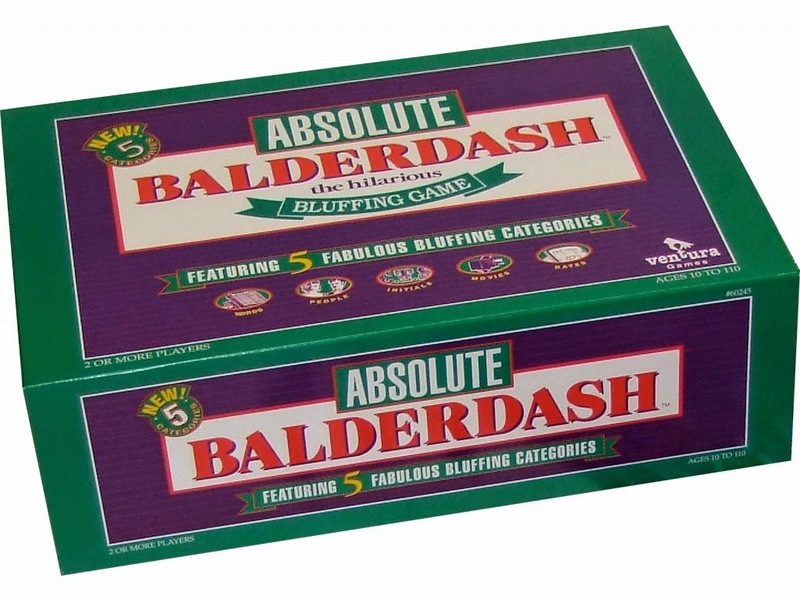 However I am told that any copy of "Balderdash" (without the "Absolute") that was printed from 2003 onwards by Mattel should be exactly the same in content as "Absolute Balderdash" - but I can't say for sure as I've only played the Ventura Games Edition. Players: 2+, but ideally suited to a crowd. Should have at least 5 people. Price Range (AUD): $35 to $84. Average price is about $35 to $45. Availability: Mainstream and widely available online. Also in game stores or department stores, given its notoriety and success. I really enjoy playing this game with creative, humourous and easygoing people. The excitement of writing a creative answer, coupled with the thrill of 'getting away with it' as each answer is read out makes for a fun and exciting atmosphere especially suited to those who enjoy a good laugh. The prospect of conning people into picking your answer is also particularly fascinating. However, not everyone will enjoy this game - especially those who aren't feeling particularly creative or in the mood for fooling other people. The game is also at the mercy of people's messy handwriting - if answers are not written legibly, the person reading out the answers will struggle/hesitate to read the answers fluently, thus arousing suspicions that that answer is fake. Also, there are plenty of other opportunities to be cunning. The person reading out the answers can deliberately stumble or hesitate when reading out a correct answer (in order to trick people into thinking that it's a fake answer); people can also vote for their own answer to trick others into voting for theirs. But if you don't like these aspects of the game you probably didn't like the concept of the game in the first place - which means the game isn't for you! Perhaps slightly time consuming as it's a written game - may require lots of paper and writing equipment. If you want a good laugh and enjoy the idea of bluffing people with your "fake knowledge" [or if you don't mind entertaining the notion of "pretending to know the answers to things" in a party environment] you should give this classic a go. ** After numerous replays, I have increased my rating. Everyone gets some paper. You can roll a dice to decide who goes first but you can decide this another way. For scoring, you can use the board and pawns provided in the game but that doesn't really matter either - see below. One of the many cards that comes with the game. Each turn, someone gets to pick a card such as the one above (this person who picked the card is known as "the Balderdasher"). Then they choose a category. Note that the person who wrote their answer must also write down their name next to their answer. Whilst everyone is writing their answers, the Balderdasher writes down the REAL answer onto their piece of paper (as stated on the back of the card). All answers get handed to the person who picked the card. The Balderdasher then reads out all the answers one by one (as many times as they like I guess by custom rules). People vote for which answers they think is the REAL answer. For every vote that a FAKE answer received, the person who wrote that answer gets as many points as votes. Ie. the fake answerer gets 1 point per vote their answer received. If no one chose the correct answer the Balderdasher gets 3 points. If any persons picked the REAL answer they receive 2 points. The process is repeated [a new person becomes the Balderdasher] until someone reaches the end of the board (you move people's pawns up in direct correlation to their score). Like I said above, you don't need to use the board or that victory condition - you can track the score manually by pen and paper and you can agree to preset a random point tally needed for victory.